What would a jazz guitar player sound like if he/she was born and raised in the jazz capital of the world, New York City? Would access to world class teachers, players, concerts and the city energy from day one be in the DNA? Well it turns out that we only have to look as far as Adam Rogers to answer these questions. Rogers was born and raised in New York City, where he studied guitar with Barry Galbraith, Howard Collins and John Scofield. During his four years at the Mannes Conservatory of Music he studied Classical Guitar with Robert Secrist and Frederic Hand. Since the beginning of his professional career he has played on over two hundred commercially released recordings and has toured extensively throughout the United States, Canada, Europe, Japan, Southeast Asia, The Middle East, The Americas and Russia. For eleven years he co-led the innovative and critically acclaimed group Lost Tribe, touring nationally and internationally and releasing three albums. Rogers is known for his modern jazz virtuosity that combines a raw, eclectic mixture of rock, funk, blues, country and R&B that reflects the gritty street sounds of New York City. 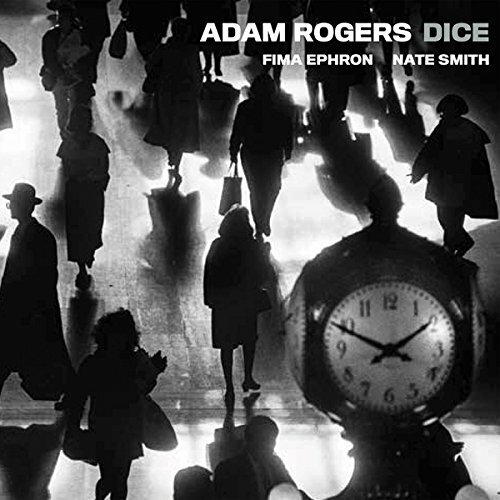 On the eponymous debut release by Adam Rogers’ DICE, the trio brings together Rogers with a pair of longtime collaborators: bassist Fima Ephron and drummer Nate Smith – two of the most dynamic, versatile, and sought-after musicians in the world of improvised music today. The album reflects the varied influences of Jazz, Funk, Rock and experimental music that have imbued Rogers musical sphere since first picking up the guitar. He has crafted a body of work for the trio that sonically reflects these influences into a cohesive, groove laden musical concept that is instantly heard in the opening title track, “Dice.” With his slightly distorted strat, Rogers plays a rhythmically repeating figure for an intro that would be right at home on an Electric Ladyland era Hendrix album. The melody is jagged through an ever-evolving form. Smith’s drumming is excellent and emphasizes Roger’s complex rhythmic style. Roger’s solo is full of emotional bends and quick riffs. Sonically, Rogers sound while soloing is a nice spiky distorted strat sound, he switches to the front pick-up for some sweet picking phrases, but predominantly keeps the pick-up selector on the back pick-up for its clarity and drive. “Flava” has a more ‘metal’ edge to it, with a darker distortion and more rock sounding voicings. Rogers still favors a slightly frantic rhythmic style that is very effective in building energy. The gritty street sounds can be heard as the trio re-establishes the pulse and creates a swirling sound of effects that leads to another rhythmical repetitive motif. Rogers solo is a study in modern jazz influenced rock/blues, blending the rock sounds of bends, and patterned pentatonic licks with the chromatic and wide interval leaps of jazz. Ephron and Smith keep a rock steady pulse and fill the space around Rogers with cohesion. DICE’s version of the Patsy Cline’s classic “Crazy” that is penned by Willie Nelson is interesting. Rogers basks in melody subtly with his lyrical, warm sound of the Fender Telecaster. Rogers was inspired to interpret the song by Tele-masters like Jimmy Bryant, James Burton and Roy Buchanan, putting his own unique, distorted inflection on the tradition over Smith’s murmuring brushwork and Ephron’s boastful bass. There are some moments when his playing reminded me of the late great Danny Gatton. With DICE, Rogers, Ephron and Smith relate the sounds of New York City with a visceral musical invention that finds its base in the influences of Jazz, Funk, Rock and experimental music of the 60’s and 70’s. The music has tones of rock, funk, blues, country, and jazz as only these three innovative artists can create it. More often than not, the music is rhythmically jagged and shifting, but always moving in a unified direction that is energetic and a real pleasure to hear.